https://choroschool.com/wp-content/uploads/2014/03/headerlogo1.png 0 0 Choroschool https://choroschool.com/wp-content/uploads/2014/03/headerlogo1.png Choroschool2018-05-03 16:56:512018-05-03 16:56:51Start Spring Season 19 May 2018!! It’s no joke! After searching for eggs and a delicious Easter breakfast you can come to Grounds with the whole family for a wonderful Brazilian afternoon and evening. https://choroschool.com/wp-content/uploads/2014/03/headerlogo1.png 0 0 Choroschool https://choroschool.com/wp-content/uploads/2014/03/headerlogo1.png Choroschool2018-01-11 14:11:532018-01-11 14:11:53Lessons start again 13 January 2018! 4th of November a masterclass of our guests from Brasil! 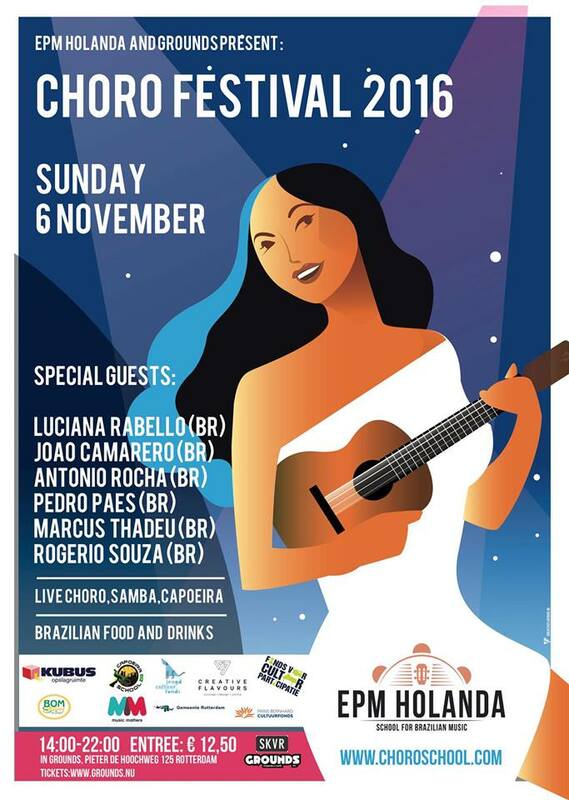 On the 5th of November our 5th edition of the Choro Festival in Grounds Rotterdam! With special guests guitarist João Camarero and accordeonist Bebe Kramer from Brazil. And of course many other artists, good food drinks and happiness!! Looking forward! After the summerstop we go for the next season of 14 lessons like always on the saturday. 20:15 Magda Mendes Vocal Groups, Ivy Lemos and Ingmar Sterke, Vatapá. Luciana Rabello (Cavaquinho), João Camarero (Guitar), Antonio Rocha (Flute), Pedro Paes (Sax /Clarinet), Marcus Thadeu (Percussion) and Rogério Souza (Guitar).